I am an avid Goodwill shopper so I was looking in the dress section for something cute in January and came across this dress in my exact size!! As soon as I saw it I thought it looked EXACTLY like the Beetlejuice dress so I knew I had to figure out a way to make Beetlejuice costumes for our family! All of our clothes are from Goodwill (minus Beetlejuice) and the masks are 100% homemade. The masks are made out of cereal boxes, duct tape, and wire hangers for the frame (they are also attached to a hat). Then I paper mache’d them using newspaper, flour, and water. I let them sit for a day to dry, then I painted both of them. After that, we cut up paper towel rolls to add dimension and ridges along the sides of the masks. For the teeth, we used packing peanuts crumpled up since that wouldn’t be heavy and weigh them down, and the tongue is made out of an old dishrag that I painted pink with pipe cleaners glued on top of a toilet paper roll! I got a thin black T-shirt from Goodwill and cut it up to use as the eye holes and mouth fabric. Lastly, I bought wigs similar to Adam and Barbara Maitland and safety pinned them to the back of the hat/masks. The Barbara mask was a bit heavy, so I cut slits in the bill of the hat and added a couple of hair ties to make it tighter on my head which helped with the weight. We found styrofoam eyeballs at a craft store and drilled out holes for Adam’s fingers as well as gold round glasses in case he wanted to take the mask off. Lydia Deet’s camera is actually my 80-year-old grandma’s original camera from when she was a little girl, which is super neat!! We got some liquid laxtex to add some moss on Beetlejuices face. 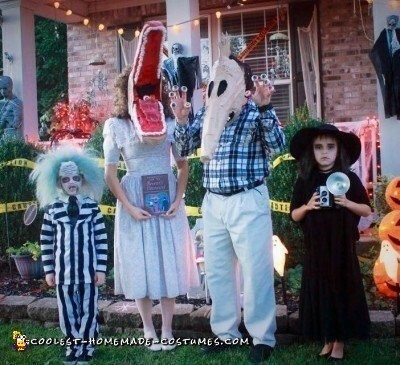 When we walk around we make sure to play the Beetlejuice theme music, people have gone crazy for our homemade costumes and told us they were the best they had ever seen!! I also found the book “The Handbook for the Recently Deceased” which I thought was a MUST have for this costume!! Totally adds a little extra to it!